The War on Coal is well and truly over, but a peculiar debate over its impact lingers on. Revisionist history is central to this debate, with some folks now suggesting that the coal industry was never in a two-front struggle against both a regulatory onslaught and cheap natural gas. Instead, they argue, it was a one-front war against natural gas all along. President Obama may have marshalled his regulatory agencies for battle, but who knew they were firing blanks? The irony here is that those most committed to imposing plant-closing regulations on the coal industry during the Obama years now seem invested in convincing the public that the very same regulations were not a factor in coal’s decline. This debate famously erupted during last year’s presidential campaign when Hillary Clinton walked back her “we’re going to put coal miners out of work” gaffe by blaming the “market” for any job dislocations (we addressed that episode here). The latest and most thorough example of this comes from a recent study by the Columbia University Center on Global Energy Policy (CGEP). CGEP is a reputable and prolific organization that contributes to a robust and healthy debate on energy and environmental issues. In the case of this particular analysis, however, the group employed a deeply flawed methodology to justify preconceived views on the challenges facing coal. Despite the report’s forward-looking title—“Can Coal Make a Comeback?”—it mostly involves a retrospective examination into the causes of recent declines in coal-fired electricity generation. The headline conclusion is that, contrary to popular belief, regulations were an inconsequential factor in this shift. In fact, CGEP goes so far as to attribute 100% of coal’s decline to non-regulatory factors. It does so through an odd mathematical exercise that compares the Energy Information Administration’s 2006 Annual Energy Outlook (AEO) electricity projections for the year 2016 with actual data from 2016. It then compares the differences between what was projected to happen and what actually happened across a handful of categories. Let’s start with the obvious first. Why was the AEO 2006 chosen for this analysis? And why would anyone expect it be anything but completely different from reality? Consider that the AEO 2006 forecast was issued years before the Shale Gale hit full force, before the Great Recession, before the election of an anti-coal president, before the imposition of the Environmental Protection Agency’s (EPA) Mercury and Air Toxics Standards (Utility MACT), Clean Power Plan, and other rules . . . before a lot of pretty big stuff. So the AEO 2006 seems an odd choice for a baseline. *Percentages actually reflect differences between 2006 EIA Annual Electricity Outlook projections and actual generation in 2016. This comparison reveals no information regarding the cause of those differences. As the table illustrates, there is a major methodological flaw with this approach. In short, summarizing relative shifts in electricity generation tells us only about . . . relative shifts in electricity generation. It describes, but it does not explain. In fact, it tells us nothing about the degree to which market, regulatory, or other factors contributed to those shifts. The potential impact of regulations on coal retirements is nowhere to be found in Columbia’s apportionment calculations. Any coal plant retirement caused by an EPA rule between 2006 and 20016 would be chalked up as “caused” by the fuel that replaced it. A football analogy helps to illustrate the problem with this design: if the starting quarterback gets injured and is forced out of the game, the logic used in this report would conclude that “increased competition” from the backup QB is “responsible for” the starter’s subsequent reduction in playing time. So if Columbia’s attribution claims are not credible, whose are? We think there is something to be said from checking with the horse’s mouth—the actual owners of retired coal plants. My colleague Heath Knakmuhs did just that in a thorough review of coal plant retirement announcements during the legal battle over EPA’s 2011 Utility MACT, or “MATS” regulation. He found that utility owners cited EPA regulations as a factor in the closure of 163 power generation units. Georgia Power Company’s 2013 integrated resource plan filed with the Georgia Public Service Commission stated, “Unfortunately, the projected costs to comply with the MATS rule … and other pending environmental regulations have placed significant pressure on the economic viability of several of the Company’s fossil generating units to the point that retirement is the most cost-effective approach.”[vi] Georgia Power Company retired nine coal-fired electric generating units as the result of this IRP. Official filings such as these tend to be free from hyperbole and thus are a reliable indicator of motivations behind utilities’ decision-making. In total, ACCCE estimates that three-fourths of coal retirements, including announced but not yet retired plants, since 2010—more than 75 GW—have been attributed to EPA regulations. Environmental regulations affecting power plants have also played a role. About 30% of the coal capacity that retired in 2015 occurred in April, which is when the U.S. Environmental Protection Agency's Mercury and Air Toxics Standards (MATS) rule went into effect. Some coal plants applied for and received one-year extensions, meaning that many of the coal retirements expected in 2016 will likely also occur in April. Several plants have received additional one-year extensions beyond April 2016 based on their role in ensuring regional system reliability. Finally, CGEP also glosses over the production tax credit for wind power, which also has been a large non-market factor affecting coal plants. The most recent EIA subsidies report, for example, shows that in fiscal year 2013, the latest year for which data are available, for every 1,000 kWh of electricity produced, wind received a subsidy exceeding $36.00 compared to coal’s $0.60. This is not to say that competition, especially from natural gas, has not been a factor in coal’s decline. It obviously has (ACCCE estimates non-regulatory factors drove about 24 GW of retirements). In most cases, retirement decisions are driven by the combination of market and regulatory pressures. And it’s important to recognize that the elimination of regulatory pressures will not change the fact that cheap gas, along with the boom in federally-subsidized wind capacity buildout, threaten to force additional non-regulatory closures in the years ahead. None of this, however, changes the fact that reams of evidence support the argument that EPA regulations were major drivers of coal plant retirements. It’s what these regulations were designed to do, after all. Explicitly ignoring them simply isn’t credible, nor is employing a faulty method and using an outdated EIA projection that had no inkling of the regulatory blitz to come. At the risk of piling on, it’s important to point out another shortcoming in the report involving a supplement to the aforementioned generation shifting analysis in which the authors separately attempt to quantify the impact of ten different Obama Administration regulations on coal generation. How do they do this? By simply adding the projected coal impacts detailed in EPA’s regulatory impact analysis (RIA) for each rule, ultimately concluding that federal regulations were responsible for a 3.5% decline in coal production. This, the author’s argue, is a relative pittance compared to their claim that competition from gas accounts for 49% of the decline. This methodology is also highly flawed. First and foremost, it strains credulity to base conclusions on six year-old EPA RIA projections when far more current and reliable retrospective data is available. This is especially so given that, despite suggestions in the report to the contrary, EPA RIA projections for the rules in question have proven to be wildly inaccurate. 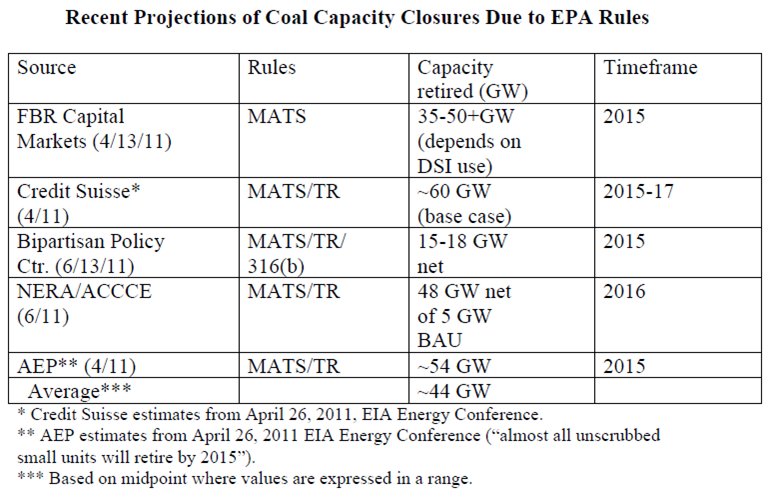 For example, upon finalizing the MATS rule in 2011, EPA projected that it would force the closure of just 4.7 GW of coal capacity. By contrast, numerous industry and financial sector stakeholders warned that retirements would be between 35 and 60 GW—roughly an order of magnitude larger (see table below)—and they were right. With the benefit of hindsight, it’s now well understood that EPA wildly underestimated the negative impacts of its regulation (credible analysis from sources such as EIA support this). Unfortunately, the CGEP report still chose to use these erroneous projections in support of its conclusion that regulations were a relatively negligible factor in retirements. Again, we generally find Columbia’s Global Center on Energy Policy to be a reputable and valuable contributor to the energy and environmental policy debate. But in this case, a faulty study design led to faulty conclusions on an important issue, so we felt it important to set the record straight.